konstruksie skuim, specifically polyurethane foams are used as the foam core of every IADDIC SIP Panel structure. Of jy nou die bou van skuilings, huise, skoolgeboue, of kommersiële strukture jy 'n strukturele materiaal gebou moet wat sal hou om die mees veeleisende programme. Together with structural skins like OSB or MGO, the foam panels cores provide the rigidity needed to ensure your structures withstand the rigors of use for decades to come and can be used in load bearing situations up to 3 stories high. The polyurethane foam we call SIH is a closed-cell foam material. Maybe the largest economical reason to use IADDIC Panel Building System is to capitalize on the condensed nature of the foam. In its raw state, it is a number of liquid chemicals. Once these chemicals are mixed together, the reaction causes them to “foam” and it expands up to 20 keer. This means nothing ships as efficiently as IADDIC SIH! Gewaarborg! The polyurethane foam comes in either 55 liter Drums, of 350 liter Entire. 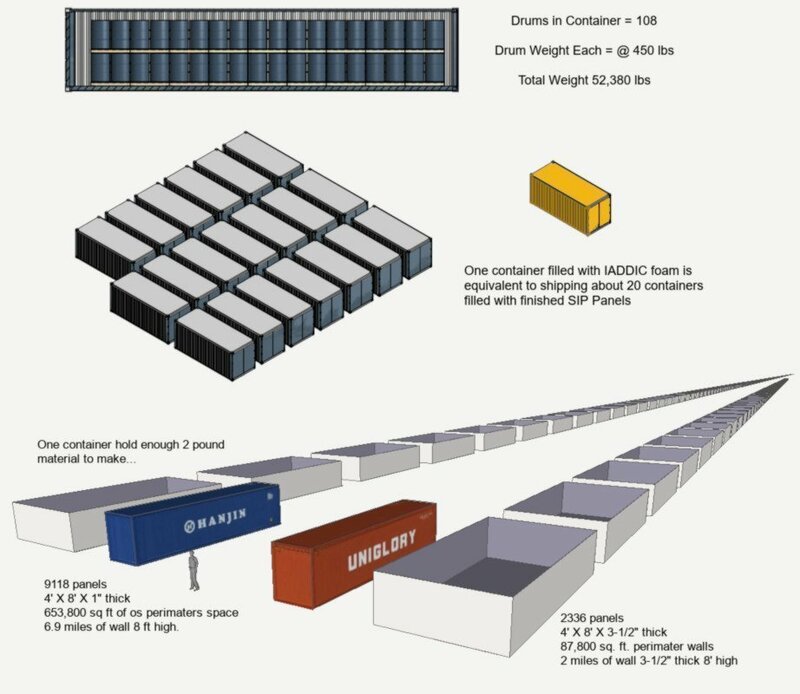 One 40′ shipping container can hold about 108 drums or 52,380 lbs of foam. That one container is equivalent to shipping 20 containers of finished structural insulated panels. That amount of foam can produce 9118 1″ thick SIP Panels or 2336 panels with a 3-1/2″ core. The one-inch panels can produce a wall about 6.9 miles long, 8 feet high and the 3-1/2″ core panels can produce a wall about 2 miles long. Structural polyurethane foam has been used in SIP Panels for construction since the early 1950s and has been used to build millions of square feet of houses, woonstelle, kommersiële gebou en net omtrent elke ander tipe van die bou denkbaar. Although no longer part of our line-up, we’ve used this foam to construct entire shelters and small houses completely from foam. SIH konstruksie materiale are also Environmentally Friendly. We have taken the extra steps to ensure our materials are in keeping with our philosophy to not harm the environment (sien ons omgewingsimpak verklaring). The table below highlights the blowing agents that we use is zero ozone-depleting, het geen aardverwarmingsvermoë, en bevat geen Vlugtige Organiese Chemicals. And our highly insulated panels are @ R6.5 per inch and save tons of natural resources by requiring less fuel to heat and cool a building.